A diamondback terrapin turtle surrendered on Saturday. Two turtles that are illegal to keep as pets in Suffolk County were surrendered to officials on Saturday. The two diamondback terrapin turtles were turned in during an animal amnesty event held by the Suffolk County Society for the Protection for Animals. The turtles were once considered a delicacy and threatened by hunters, according to the Huntington-Oyster Bay Audobon Society. Now, the turtles are at risk due to habitat destruction and getting caught in crab pots. 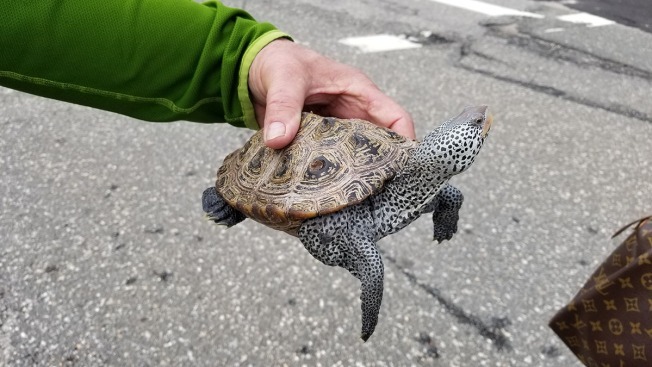 Other animals surrendered on Saturday included two red-eared slider turtles, an iguana, two red-bellied pacu fish, two yellow-bellied turtles and an African spurred tortoise.